Straight from an email I received from Al Gore (Steve Milloy’s reproduced an identical one to him): I’m pleased to invite you to join me for an interactive Google Hangout with my good friend Jeff Skoll tomorrow, June 11, at 2pm EDT …. Most importantly, I want to invite you to participate in shaping the conversation by submitting your questions and watching the Hangout here. Well, I gave it a shot. 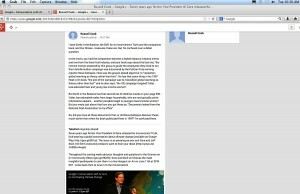 It appears the Google+ Conversation with Al Gore about Combating Climate Change event is very selective on which comments / questions it actually accepts. The one I submitted (screencap of it below, just in case), based on a problem I pointed to in my blog here yesterday, did not make the cut, apparently. Will Gore attempt to answer the question if it ever gets to him? I’m not taking bets he will….. 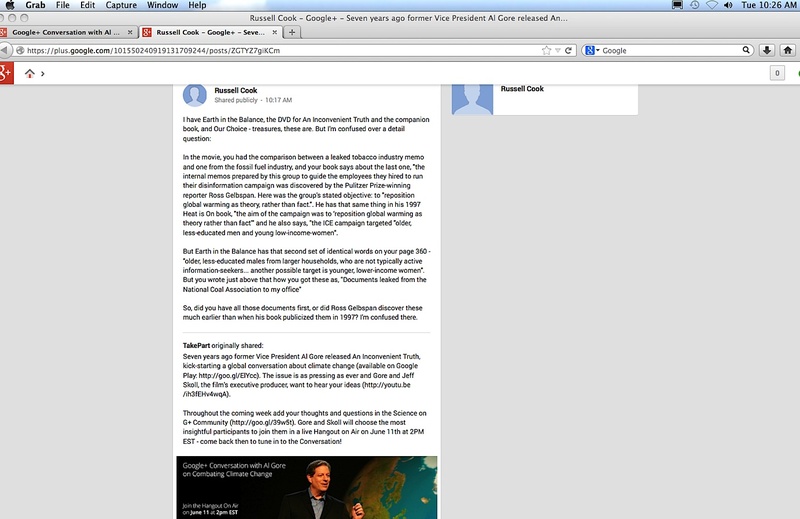 This entry was posted in Al Gore and tagged combating climate change by Russell Cook. Bookmark the permalink.